Homeowners today have a choice of bathroom sink drains, and various types offer different advantages. Although the point of the drain is still the same, reviewing all your options before installing a new drain makes sense. Some pitfalls are easily avoided when you choose a drain based on your bathroom needs and functionality. 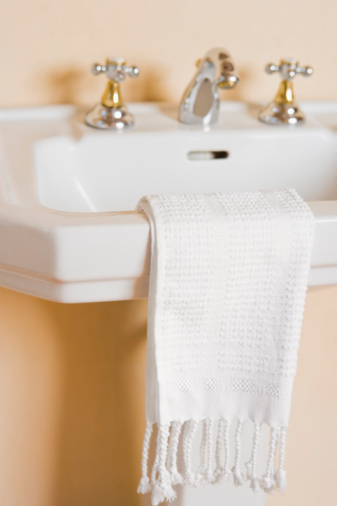 Sink drains in a bathroom usually handle water from handwashing and shaving. A pop-up drain is one of the most common types of bathroom sink drains on the market today. This drain has two pieces: the outer drain sleeve and an inner plug unit with a long arm. The arm attaches to a drain plug rod behind the faucet, which pulls the plug up or down. When the plug is pulled down, it seals the drain hole, allowing the sink to fill with water, which is useful when shaving, washing your face or cleaning your hands. More versatile and user-friendly, the pop-up drain is generally installed in homes, hotels and some restaurants where comfort and usability take precedence over efficiency and low-maintenance fixtures. Although pop-up drains are not as maintenance free as grid drains, they are relatively easy to repair when they do break. Replacing the drain rod takes about 10 minutes and requires only a pair of pliers. For the home, the small hassle of fixing the drain every so often is worth the effort to have the versatility the pop-up drain offers. The grid drain has no plug. Instead it has a grated surface that is actually a sheet of metal with holes punched into it. This type of drain does not allow the sink to fill with water. It is designed to stop small objects from sliding down into the drain and clogging the drain lines. If the concern is preventing clogs, this type of drain is a better choice because a pop-up drain is susceptible to clogging. Since it is more robust than a pop-up drain, the grid drain is the ideal choice for restaurant bathrooms and lavatories with lots of traffic. Most public bathrooms have a grid drain instead of a pop-up drain. Due to the fact that pop-up drains have more moving parts, the drain requires more maintenance. However, since the grid drain prevents items from slipping into the drain lines, it reduces clogs. The grid drain also prevents the sink from overflowing, a major concern in public restrooms. Do Bathroom Faucets Come With a Drain Stop?